Ray Wheeler doesn’t want to walk through the old gristmill in Selma. The large, red-roofed wooden structure — visible from the front porch of his office — has a stillness and quiet that doesn’t suit this peripatetic salesman and engineer. At 82, he has bright eyes, a quick smile, and a purposeful stride, all the better for a tour of where the real action is: up the hill and through the modern buildings where cornmeal is stone-ground, packed, and shipped to restaurants and stores across the Southeast. 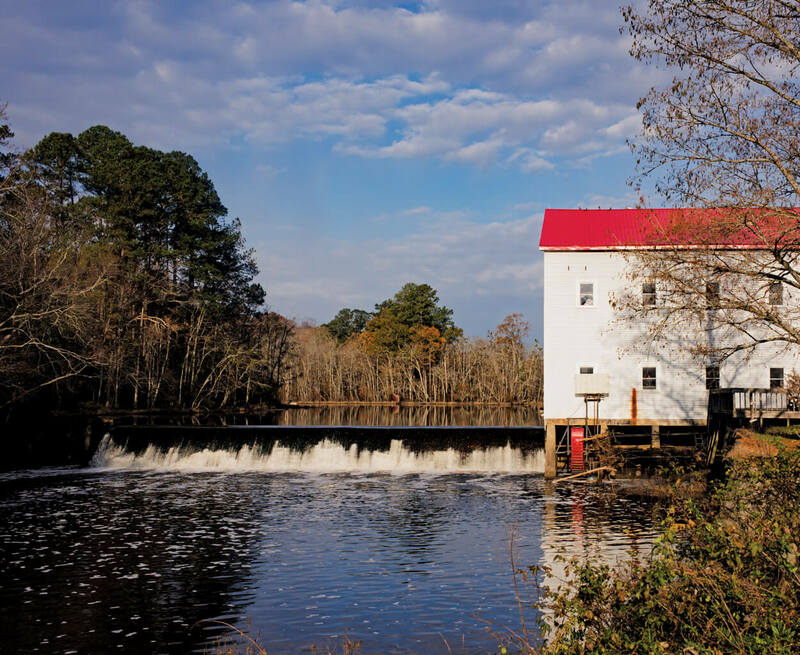 I visit the mill on a warm October day, when the sky is that particular brand of gorgeous that arrives after a hurricane, pale blue streaked with high cirrus clouds. Selma didn’t see major damage from Michael, which blew through a few days before, or Florence, which hit a month earlier, but the town is still feeling the effects of 2016’s Matthew, which flooded the old mill and forced business operations to higher ground. On Ray’s insistence, I brought along my 5-month-old daughter, Harriet. I’m curious about how well this will work — reporting while toting a baby — this incorporation of family and professional life, which the Wheelers, for generations, have taken for granted. Ray’s eldest son, Glenn, is president of the company now; his next-oldest son, Ben, is vice president. Two grandsons, Joseph and Andrew, work to modernize production; a granddaughter, Misty, works in the mill. Betty, now 80, ran the office until about 10 years ago. 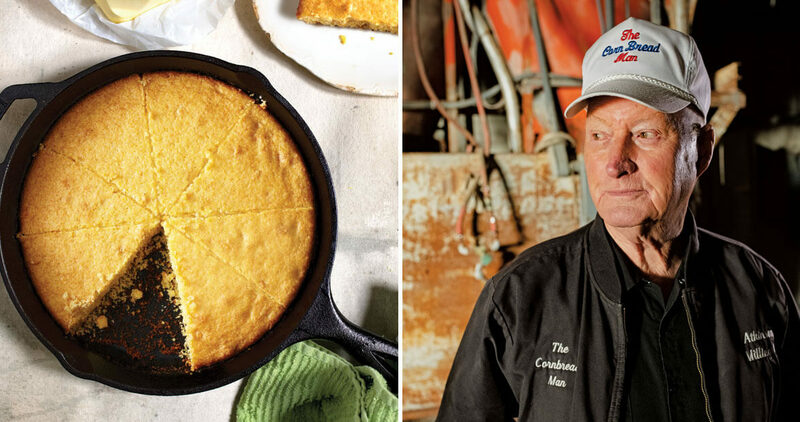 In addition to members of the Wheeler family, the company employs more than 60 people, who take orders, grind, mix, bake, pack, and ship the products that The Cornbread Man is known for. While office staff care for Harriet, Ray and I tour the mill facility, frozen-food plant, and shipping warehouse, buildings he added as the business prospered. He points out the machinery that he built himself, the cornbread oven he bought used years ago, the millstones that are more than 100 years old. He shows me the corn stick molds, lined up to be filled and baked with the eastern North Carolina specialty. We walk past pallets stacked with “Sweet Betsy” the hush puppy mix — inspired by his wife. 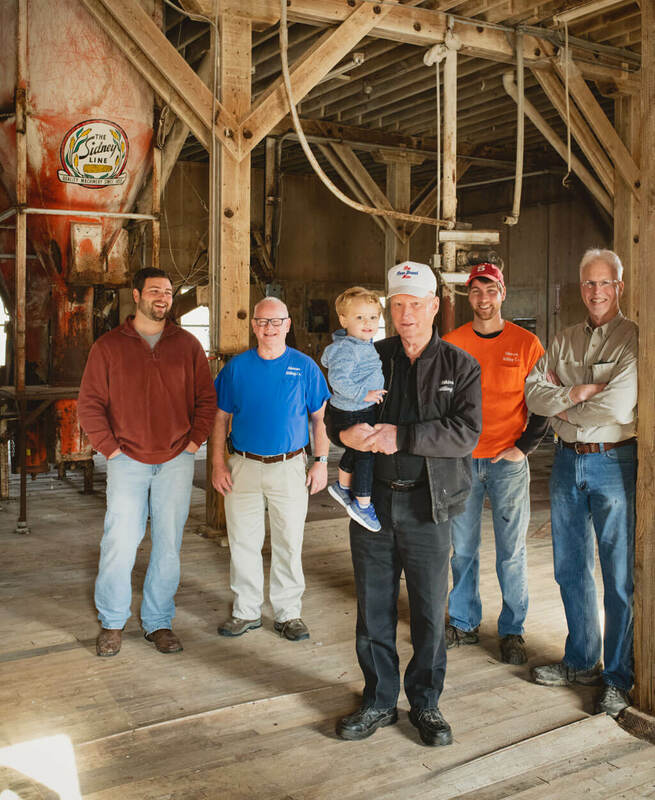 Atkinson Milling Company makes a wider range of products now — cornbread, cornbread mix, corn sticks, hush puppies, seafood breading, and pastry, as well as cornmeal and grits — but it remains a hands-on team effort. We find a dozen workers in the pastry room, which is noisy with laughter and talk. Ray steps away respectfully when I speak to his employees, so he doesn’t hear one young woman say, fondly, “That’s my grandpa.” They admit that he can be a perfectionist, tossing product that doesn’t meet his high standards. But he also likes to cook for them — all of them — hosting fried chicken picnics and Thanksgiving meals. Today, the women are packing prebaked corn flatbreads, popular in barbecue restaurants, into tidy white boxes. In another area of the frozen-food plant, two men mix great slabs of dough. Years ago, when Ray first introduced this dough, the local women said their young ones wouldn’t accept it in their Sunday chicken and pastry. “They didn’t want it at first,” Ray says, explaining that he gave away the first batches. Then those same women came back the next week, looking for bigger boxes. It was a delicate balance, expanding the company while preserving the quality of products long associated with the Atkinson’s brand, but Ray’s mind is the type that bends toward innovation. Though he grew up sopping his cornbread in local cane syrup, he knew there would be an appetite for convenience foods made from favorite traditional recipes. Betty, after all, worked in a shirt mill before their business took off, and when she returned to the corn mill, she was busy running things at home while Ray made sales calls across the state. He also knew something else: “If you don’t give your customers some service, somebody else will.” That’s why he answered calls even at night, like the one he received one Friday from a restaurant owner who found his phone number on the back of a bag of cornmeal. The customer’s hush puppy machine was acting up, and he didn’t know how to fix it. “You just go home, go to bed, and when you get there in the morning, I’ll be there,” Ray told him. Ray kept — still keeps — a panel truck outfitted with a bed, a bathroom, and an AC unit for his wide-ranging, sometimes spur-of-the-moment sales calls. He arrived at 2:30 a.m., went to bed, and was up, shaved, and ready to help when his customer arrived at work the next day. “He didn’t believe it when he saw me,” Ray says. Ray and Betty can see the original building from their small blue house, which sits on a hill in the center of the mill property. The living room walls are covered in photos and paintings of the mill in its various stages of growth, and dozens of framed photos of the family that has grown with it. Ray has caregivers and family looking after Betty at the house. She sits contentedly at the kitchen table, where dinner is spread — spaghetti, meatballs, and a platter of hush puppies. I can’t help sneaking one before we’ve said grace. The hush puppy is still hot, fragrant with onion and corn, and subtly sweet. Two of Betty and Ray’s grandchildren sit around the table. Biscuit cutters and whisks — the useful, not decorative, kind — hang from hooks on the cabinets, and I think about my mother’s kitchen, with long-seasoned skillets hanging above the stove. The Wheelers have loaded my car with bags of yellow grits and stone-ground cornmeal. I’ll take some home to bake my own cornbread, slicking the cast-iron skillet with butter so that the edges bake up golden and crisp, just like Ray’s hush puppies. “Who am I?” Betty asks softly every now and again. “You’re my baby doll,” says Ray, his voice gentle and certain. Harriet coos in my lap. Ray was right about her. She spent the morning happily passed from person to person at the mill, and now she reaches for the table, eyeing the food. Betty pronounces her “beautiful” and waves at her. Belle Boggs is an associate professor of English at NC State and the author of The Art of Waiting, Mattaponi Queen: Stories and The Gulf: A Novel, forthcoming in April.